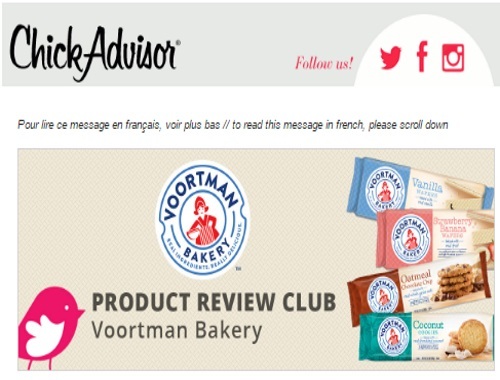 Chickadvisor has a new Product Review Club offer for Voortman Bakery! 350 American and 150 Canadian women will have the chance to try out yummy Voortman bakery products including: Voortman Vanilla Wafers, Voortman Strawberry Banana Wafers, Voortman Coconut Cookies, Voortman Oatmeal Chocolate Chip Cookie. Click on the link below for more products details by February 19, 2017 for your chance to be one of the testers. Offer open to residents of Canada and United States only. Selected members will be contacted by email the week of February 20, 2017. For extra consideration, help share this opportunity on social media and remember to include #VoortmanBakery.